In 2004, Bryan and I were looking for a new place to call home. Coming from demanding corporate health care and venture capital, requiring constant communication and travel, we’d shifted gears. Bryan was working on his Ph.D. in Theology, and I wanted to go back to my farm roots. We needed to be close to NYC for Bryan’s studies, but not too close. We wanted community and beauty. A farmhouse on Handsome Brook Road with five acres, a beautiful red barn, a tire swing and East Handsome Brook behind was perfect. It became our home. The house was what drew us, and its idyllic setting. There would be a lot to learn about the community, but we looked forward to exploring and getting to know people. One of the first was Ellen Curtis, who welcomed us with open arms and invited us to join Franklin Local – a varied group who shared a common interest in environmental stewardship and community. Around monthly tables full of home baked goods, fresh produce and wonderful conversation, we discussed everything from peak oil to the farmers’ market and the needs of the community – always with a focus on what would protect and serve the Franklin community. This was a place we could put down roots. Bryan and I planned ultimately to retire in Franklin. But even with our corporate jobs, we’d always had businesses on the side. It’s an entrepreneurial habit, – you see a need and you want to fill it. In 2007, we added a few rooms to the house for friends and family, and thought of opening a B&B to help pay for the renovations. We’d never operated a B&B, but liked the idea of sharing our home and community. City people might enjoy the peace and quiet of the country and the chance to feed and play with farm animals, help in the garden, and share thoughts on sustainability and animal welfare. We had small expectations: would anyone make the three-hour trip from the city? But there was renewed interest from city folks wanting to learn where their food comes from. Then, during our first season, Good Morning America did a fifteen-second feature on us as a top Eco Friendly Destination. After that, we stayed busy each season, hosting hundreds of families, and making lifelong friends in the process. Entrepreneurism is a way of life for many in Franklin. To make ends meet, we cobble together income from our hobbies, passions, or talents – often multiple endeavors at the same time. For Bryan and me, that included growing and selling blueberries, jams and jellies, and pickles. We sold them at the Franklin Farmers’ Market. We hoped one of these efforts would provide sufficient income, but with the seasonality of blueberries and the long shelf life of jams, it didn’t seem likely. The game changer was the support of local business offered by our Oneonta Hannaford store, and ultimately the Hannaford corporate office. In 2009, I went to the Hannaford with a few jars of jams and butters, and some homemade labels. To my surprise, they brought us in and introduced us to the still-mysterious retail grocery business. The next year, I brought a few half pints of blueberries: would the produce manager be interested? His corporate boss was there and suggested he try us out. By 2008 our Bed & Breakfast was running at full tilt. One of our guests’ most frequent comments was how delicious our eggs were. They’d want to take some home with them. But why should ours taste so much better? We learned that few of the brands available in grocery stores, even organic brands, encouraged their hens to go outside. And as anyone with backyard chickens will tell you, that makes all the difference. So, starting again with our Oneonta Hannaford, we brought in a few dozen eggs. When those sold well, we bought similar eggs from farms in the area, to be sold under our Handsome Brook Farm brand name. Soon, other Hannafords and then Price Choppers wanted them….and we grew. 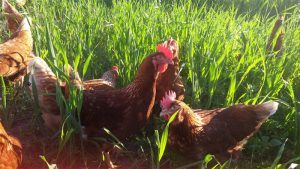 Handsome Brook Farm is now a national leader in pasture raised eggs from humanely raised hens, most of the farms being organic. When we started, no one was talking about living conditions for layer hens. Now entire states and corporations are talking about it. 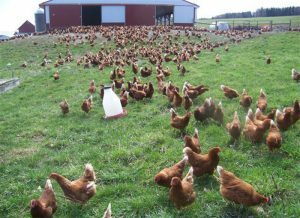 The shift to cage-free is not far enough, but a very good start. We now contract with over eighty farms throughout New York, Pennsylvania, Maryland, Virginia, North Carolina and Indiana, and our Handsome Brook Farm Pasture Raised Eggs are available from coast to coast at over 5,000 stores. Still, what makes me happiest is to see someone buy local eggs at the farmers’ market. We’re there to fill in the gap when local eggs aren’t available. In general, there are tremendous resources in the area, and tremendous opportunities for businesses to develop, grow, and thrive in Franklin. There are people committed to providing emotional and intellectual support, and one of the largest, most affluent markets in the world less than a four-hour drive away. There are also challenges. Franklin desperately needs broadband internet to speed up download and upload times, and it needs to extend to all parts of Delaware County. Cell coverage desperately needs improvement. There is increasing opportunity and need for local, county, and state government to support the development of different sorts of businesses than they are familiar with. This will provide jobs, help keep Franklin residents in the area, and attract new contributing members of the community. As things often do when entrepreneurial businesses grow, Bryan and I have moved aside, and are thrilled to have a leadership team in place to run the day-to-day sales and operations. We know our managerial limitations, and the business and customer needs have grown beyond us. 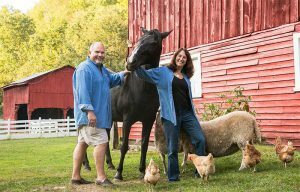 We take daily pleasure in knowing that Handsome Brook Farm now helps provide a living income to over eighty small family farms…and knowing that the hens on those farms are humanely raised. We do and will always love Franklin and be grateful to this community for giving us both roots and wings.